As the battle for the computedtomography (CT) system with the greatest number of slices continues to rage among technology vendors, clinical practitioners are reaping the benefits. In recent weeks, one company has installed its first 40-slice CT system and another has received clearance to market a 64-slice system. Siemens Medical Solutions (Malvern,PA) recently announced that they have received FDA approval for two new CT systems: a 64-slice system and a large-bore 16-slice system. Built on the company's Sensation platform, the Siemens Somatom Sensation 64 CT system provides 64 submillimeter slices per rotation at a rotation speed of 0.37 seconds. According to Murat Gungor, U.S. Marketing Manager for Somatom Sensation products, several new technologies have made this system possible. "One of them was the X-ray tube, the Stratontube," he noted. "It is a direct cooling tube, and it cools down very fast. This allows us to create two focal spots on the anode ofthe tube." This so-called "Double z-Sampling" creates the two focal points in the anode by precise deflection of the electron beam within the X-ray tube. These two points generate two overlapping beams to pass the scan field. "By this," he said, "we increase the number of readings we get out of the scan, which allows us to reach the 64-slice technology." "Utilizing the company's Speed4D technology, "the 64-slice is faster than the 16, but the real thing that this scanner gives is the resolution - a 0.4-mm resolution,' said Gungor. "What we see today is that everybody wants to have speed, but the real thing that they are looking for is resolution. Compared with what we had before, which was often 0.6 mm, this 0.4-mm resolution is a dramatic change, and it will allow a lot of clinical applications, such as cardiac scanning and other types of vascular scanning." The first unit is currently being installed in Germany, and the first U.S.installation is scheduled for June, with full commercial availability expected in November. 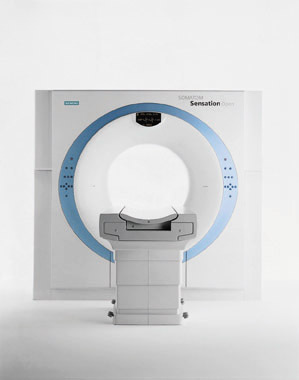 Siemens also received FDA clearance for their new large-bore 16-slice CT system, the Somatom Sensation Open (Figure). This new system has an 82-cm gantry bore with an 82-cm extended field-of-view. "It has the widest field-of-view," said Gungor. "You basically image everything that goes into that gantry." Gungor explained that the main purpose of this new system is to give the power of 16-slice CT to different areas ofthe hospital. The large gantry opening allows greater patient access for interventional procedures and is useful in radiation therapy planning. In addition, the large bore allows patients in the emergency department to be scanned quickly without removal or adjustment of life-support equipment. Finally, the large bore makes scanning more accessible for obese patients. "We are doing all this, and we are also giving the power of the 16-slice scanner," concluded Gungor. Indiana University Hospital, a member of Clarian Health Partners, is the site of the first U.S. installation of the Brilliance CT 40-slice system from Royal Philips Electronics (Best, The Netherlands). The system, with 40-mm scanning coverage and 40-slice-per-rotation capability, is being used for imaging cardiac patients and other studies of the chest and abdomen. It can scan the lungs in 4 seconds and the abdomen and pelvis in 9 seconds. Whole-body CT angiography (CTA) can be completed in 15 seconds, while whole-body scan times are reduced to 35 seconds. According to the company, the shorter breath-holds required with this system increase patient comfort and decrease the potential for movement. "The unique power of the Philips Brilliance 40-slice system allows us to image regions of the body faster, reducing patient breath-holds, requiring less contrast media, and ensuring minimal patient dose exposure," said Jonas Rydberg, MD, an Abdominal Radiologist with Indiana Radiology Partners and an Associate Professor of Radiology at the Indiana University School of Medicine. "The 40-slice system, which acquires more thin slices, is ideal for advanced applications, such as cardiology, that require visualization of small structures, or trauma, where the speed of the acquisition as well as fast reconstruction is vital," he added. W. Green, Senior Vice President, General Manager, CT, for Philips Medical Systems. "Our Brilliance family of scanners was developed through extensive collaboration with customers like Indiana University Hospital, whom we've partnered with for more than 16 years. It is through partnerships like the one we share with IU that systems can advance and maximize the clinical utilization of CT."
Philips reports that it plans to install nine more systems around the world in the next few months, with U.S. commercial delivery beginning in the fall of this year. A new contrast agent, gadoxetic acid disodium (Primovist) from Schering AG Group (Berlin, Germany), was recently approved for marketing by the Swedish Health Authority. This new gadolinium-based contrast medium was designed for the detection and characterization of liver lesions by magnetic resonance imaging (MRI), including liver tumors and metastases as well as other malignant and benign lesions. Chemically related to the company's Gd-DTPA (Magnevist), the new agent is specifically taken up by hepatocytes, thereby delivering parenchymal enhancement in healthy tissue. Cysts, metastases, and most hepatocellular carcinomas have little or no hepatocyte function and, therefore, remain unenhanced on imaging. "Primovist is a new gadolinium-based contrast medium that offers the possibility of simultaneously detecting, locating, and distinguishing various types of liver lesions, thus providing a powerful tool for radiologists that increases the diagnostic confidence," said Michael Rook, Head of Diagnostics & Radioparmaceuticals at Schering. "Furthermore, an examination with Primovist-requiring only a single contrast media injection-improves patient convenience and may have a positive impact on healthcare costs." In other news, David W. Townsend, PhD, a Professor in the Department of Medicine and Radiology, and Director of Cancer Imaging and Tracer Development at the University of Tennessee Cancer Institute, was named the Distinguished Clinical Scientist of the Year by the Academy of Molecular Imaging (AMI). The award, which was recently renamed the Peter Valk Award, was presented during the AMI Annual Meeting in Orlando, March 27-31, 2004. This award is given annually to the scientist who has made major contributions to the development and enhancement of molecular imaging and positron emission tomography (PET), as recognized by his or her colleagues. Dr. Townsend and Ronald Nutt, PhD, President and Chief Executive Officer of CTI Molecular Imaging (Knoxville, TN), conceived the concept of the combined PET/CT system and developed it with the support of the engineering team at CPS Innovations, a unit of CTI. Dr. Townsend and Dr. Nutt hold the patent for this technology. As part of the Peter Valk Award, Townsend received a $20,000 cash award and presented the Distinguished Scientist Lecture, "From 3D PET to 3D PET/CT: What Did We Learn?" at the AMI meeting. "On behalf of all of us at CTI, I want to congratulate David for this fine honor that he has received," said Nutt when the selection was announced. "The Distinguished Clinical Scientist of the Year award is the most prestigious one that an AMI member can receive from his peers. Having worked closely with David for many years as a scientist and friend, I can say that he is extremely deserving of this honor. Over his career, David has been an invaluable contributor to the molecular imaging community and to CTI, and I am delighted to see him recognized with this award." Technology and Industry: Latest advances in multislice CT technology. Appl Radiol.